There's much to see and much to do in Fire Emblem Echoes: Shadows of Valentia, and one of the bigger hurdles players will have to jump in order to hit the open water and continue their journey comes right after first gaining control of Celica. At this point in the game, players are tasked with seeking out the Temple of Mila, which necessitates the use of a seagoing vessel. Unfortunately, the ongoing threat of pirate attacks has closed the nearby Greatport, which means Celica will need to track down a new ally and gain the assistance of a reluctant old man. The first step in the process of reaching the Temple of Mila involves finding the talented swordsman who goes by the name of Saber. Players need to head over to the Novis Greatport and locate the nearby tavern, where Saber will be found waiting inside. 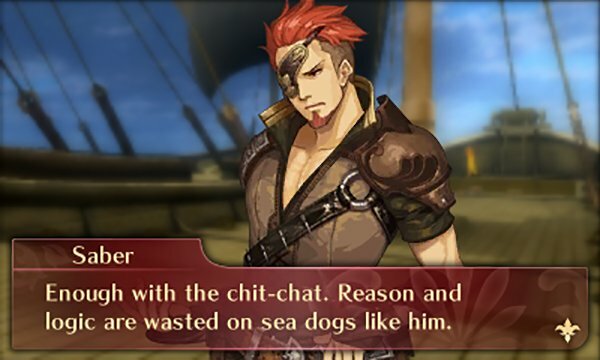 Upon speaking with him, players will find that he doesn't speak too kindly toward Celica, so head back out of the tavern and over to the Wharf to speak with the Old Timer. The old man will mention that he can't sail due to the pirate menace, but remarks that he'd be more willing if the player's party was stronger. This is the cue to head back to the tavern and speak again with Saber, where, after a short exchange and cutscene, Celica will convince Saber to join the party. With the swordsman in tow, leave the tavern and head back to the Wharf. Speaking to the Old Timer will trigger a new conversation where Celica alludes to Saber's joining of the party. Taking in the man's obvious skill from a glance, the Old Timer will agree to take the party aboard his ship and set sail. Once on board, players will be more than ready to hit the open water and seek out Mila's Temple. The next step in the process is to go back to the world map and head in the direct of the nearest enemy squad. The game will take care of the rest. Fire Emblem Echoes: Shadows of Valentia is an impressive handheld game, just like many of the titles featured on our list of the Best Handheld RPGs.